Bath time is always fun time! However, your baby's sensitive skin and eyes need gentle and nourishing care. Mamaearth Deeply Nourishing Baby Wash is crafted using several nurturing and beneficial ingredients to suit the tender and soft skin of your baby. It has several nurturing and beneficial ingredients from nature such as aloe vera, which helps moisturise your baby's soft skin and allantoin, which helps soothe your baby's body and wash away the dirt and other impurities. Glycerin extracted from coconut oil helps in nourishing the skin and increases the moisture content in your baby's skin. Orange essential oil not only provides a delightfully delicious bath but also gives your little one a fresh and clean feeling all through the day. This body wash is MadeSafe Certified which makes it the safest and the best body wash you could choose for your munchkin. Safe for babies: All ingredients used are gentle, natural and free of toxicity and irritants and totally safe for a baby's sensitive skin. 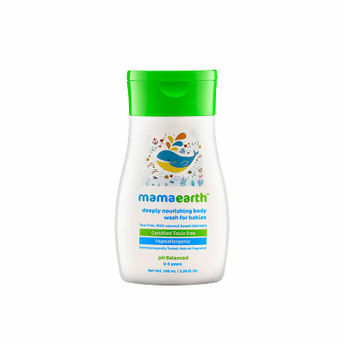 Certified toxin free: Mamaearth is Asia's first MadeSafe certified brand. All products are free of Mineral Oil, Petroleum, SLS, Paraben, Synthetic Perfumes, Artificial Preservatives and Sulphates.